The strongly scented leaves and flowers of the curry leaf plant (Murraya koenigii) cover the shrub, providing a pungent spice for Asian, Indian and Thai cuisine. Hardy in U.S. Department of Agriculture plant hardiness zones 10 through 12, curry leaf plants are generally grown as potted plants in all but a few frost-free locations in North America, such as the southern tip of Florida. When grown outdoors, the curry leaf plant prefers full or part sun, in a well-drained, sheltered, frost-free garden. Indoors, the plant requires a large flowerpot and a brightly lit location to thrive. 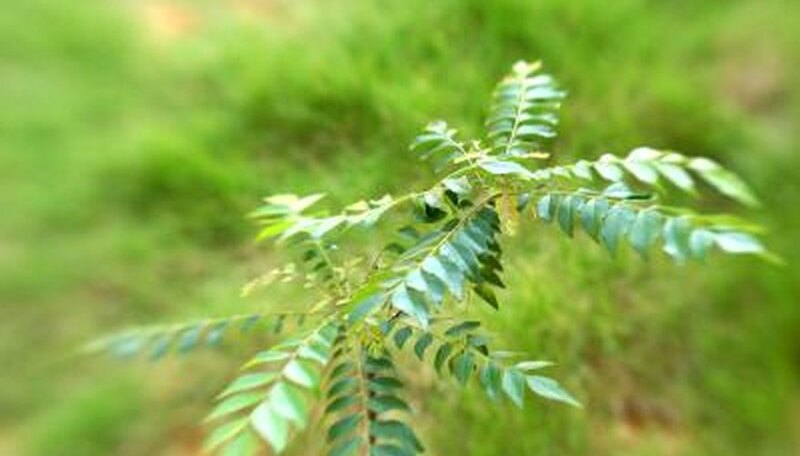 Because the curry leaf plant grows into a small shrub or tree, a large sun room or greenhouse best accommodates the mature plant. Keep the plant out of drafts caused by central heating or air conditioning. It cannot tolerate any frost, so if a rare frost threatens, protect an outdoor shrub by covering it with blankets or plastic sheeting propped up by stakes or bamboo poles. The curry leaf plant prefers a moist, well-drained soil. Water when the soil is dry to a depth of 1 inch, and then add water until it drains from the bottom of the flowerpot. If the plant is grown outdoors, water weekly with 10 gallons for every 1 inch of the largest stem's diameter. Fertilize indoor plants every two weeks with an all-purpose liquid fertilizer, such as a 24-8-16 formulation, at a rate of 1/2 teaspoon per gallon of water. Add the solution to the flowerpot until it drains out the bottom. Outdoor plants may be fertilized every seven to 14 days with the same liquid fertilizer, at a rate of 1 tablespoon of fertilizer to 1 gallon of water. One gallon of the solution fertilizes 10 square feet. In winter, stop fertilizing and reduce water to every other week until new growth appears in spring. The curry leaf plant grows up to 15 feet tall and 12 feet wide under ideal conditions. When grown in a large container or as a houseplant, prune it to reduce the size of the plant. When the plant is young, pinch back new growth to encourage bushy new growth. As the plant matures, prune in early spring to shape the plant and remove dead, crossing or too-crowded branches. Disinfect the anvil pruners between cuts with a mixture of equal parts rubbing alcohol and water. While the curry leaf plant generally has few pests, mealybugs may become a problem. The grayish-white pests cluster on the plants in groups and produce sticky honeydew, which encouraged the growth of powdery mildew. A blast of water knocks the insects off the stems and leaves. If your plant has a severe infestation, use a horticultural oil, such as neem oil, to kill the insects. Put on gloves and safety glasses before mixing 1 to 2 tablespoons of neem oil with 2 quarts of water. Spray the plant thoroughly, soaking the leaves, top and bottom, and stems. Repeat every seven to 14 days until the mealybugs are gone.